Success continued for JP’s freestyle team in 2016 with 2 riders on the PWA podium – Amado Vrieswijk NB-20 and Yentel Caers B-16. Steven Van Broeckhoven won his 5th EFPT title and French youngster Sam Esteve F-79 finished 5th overall in his first full year on the European tour. 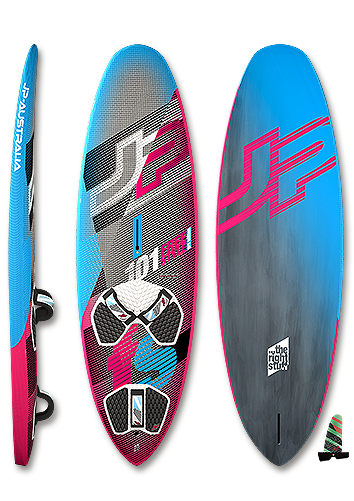 For 2018 the biggest and smallest sizes have been updated so that the whole freestyle line has the latest compact shortboard look with its awesome handling. Impressive, high scoring moves require faster rotations. Therefore, all the swing weight is centered close to the mast base and turning point of the board. Due to the compact setup the riders stand close to the rig in a very comfortable stance. This is very important not only for big moves but also for sailing in regular stance or when going switch. Our riders love the board’s higher water position and looser ride. The new bottom concept has a new V-flow to create enormous lift underfoot and to achieve higher top speed and instant pop. They are stable wide platforms to cover the biggest possible range. The centered volume distribution is the basis of all our Freestyle boards. The outline is rather parallel in the mid-section to maximize the planing surface. The rounder outline towards the tail improves maneuverability and unmatched pop not just for your first jump but also for your following air moves performed during combination moves. >> The compact Freestyle boards accelerate superbly for powerful jumps. The shortness of all the shapes enhances the handling in all moves and speeds up all rotations. The lively and direct feel imposes confidence so that amateurs and pros alike will pull-off more moves in greater style.